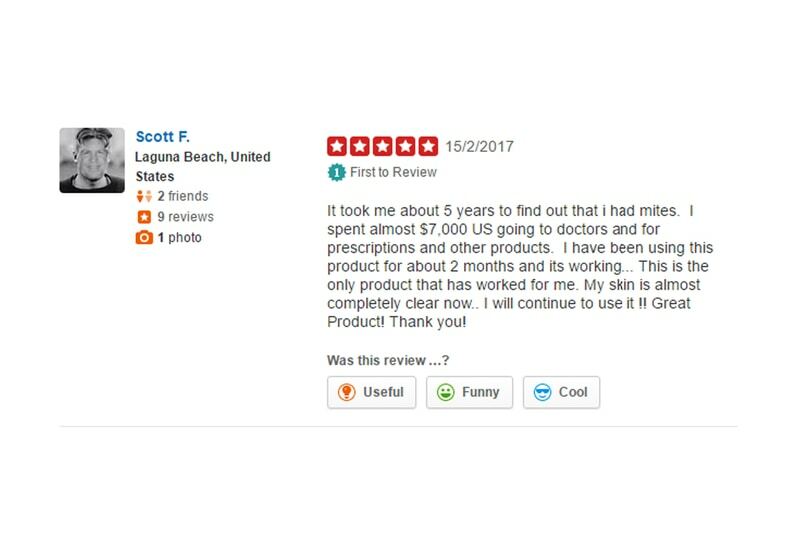 We have collected testimonials for our Demodex treatment from far and wide to ensure results help find you answers. I suffered with bad problems of flaky scalp, dandruff and rashes on my head for years. Doctors couldn’t help and after doing my own research I heard of Demodex mite. Suddenly all my so called ‘unexplained problems’ make sense. I am happy to be getting rid of them with Ungex’s kind help. Products work great, just need patience and time. Ungex team very friendly and keep following up with me to see I do treatment the right way. I have now been using the Ungex products for 3 nights in a row and i am very surprised how good they are as I have already noticed a progress. In example my back was itching at night and in the morning i could see a rash. When waering a bra and clothes my back was itching Even more. However since using the products especially spraying with the PDT my sheets before bedtime and my underwaer and t shirt the itching has completely stopped and the rash on my back is 95 percent gone. I am pleased with my progress so soon after starting the regimen/treatment with Ungex products. So far so good. I've been using PDT on my daily use and i would like to have it a bit more. Its a life saver! Am happy with the shampoos too the crawling on my body is almost no more. On the face too is surely less and less crawling each day. On the scalp its really improving and am happy. Yes am still using the products every night. Its been 1 month on the products mainly the shampoo and i noticed a big difference in hair shedding. The shedding is very minimal. I used to experience itching on the entire scalp whenever the hair was wet. This is almost complitely gone. Am really happy about it. Will keep you updated. My son had really terrible acne all over his face, chest and back. He has naturally oily skin, most teenagers do I guess. Anyway one of my friends is doing this treatment for her rosacea and after hearing about mites for the first time I thought it might be the same for my son and worth a shot trying it out (god knows we have tried all the treatments under the sun!). It’s been 1 month since he has been using and its honestly making such a huge difference already. His skin is 60% better, and the itching on my scalp has stopped. Treating the whole family in case we all caught them. 1/3 of the way through and I can’t say enough about what a difference this is making in my sons self esteem… I am so thankful to Ungex! Once you understand the habits of mite and the trail of devastation they can leave behind the answer is easy with Ungex! They are your guide and coach to steer you through all the dark and scary late night research the internet can take you. I felt so helpless before discovering Ungex. For years I suffered with extreme crawling feelings over my body, wounds, redness, bumps and all sorts of strange things happening to my skin. I spent thousands on doctors and dermatologists who couldn’t give me an answer. I locked myself up and avoided friends and family in case I was contagious. My life became a nightmare, it was truly a dark time for me. One night I stumbled across Ungex on FB and messaged them. They reached out very quickly and actually listened to what I had been experiencing! It was embarrassing to talk about but I was so hopeless I didn’t care. They gave me explinatins and answers without judgment of what I was going through. They recommended Bundle 1 and I decided to give it a try, since nothing else had worked so far and Demodex mites made sense with what I was experiencing. Well, it’s been 4 months and I can say I am truly thankful that I discovered this miracle! It was hard going at first, my die off period was intense but they walked me through it patiently and gave hope I was getting somewhere. Im still continuing to make sure all mites are gone but I am already 200% better than where I started! My advice is that if anyone is suffering as nearly as bad as I was do the protocol and put your trust in these guys and listen to them, and you wont be sorry. I have to begin saying that i found you on one of the scariest and darkness night of my life. I prayed for God to direct me to a miracle, to someone who would hear my fear, frustration, & isolation i had come to know all to well. In my heart i was brought in the path of a true, beautiful and compassionate angel that night. Her words came to me just in time...i know i might sound a little too extreme and i guess i am. You see i have been battling an unseen invasion to my body and i was beginning to think i had been cursed and whatever this thing was invading me left me, hopeless, great fear and even feeling myself slip deeper into seclusion and shame. Attempting to reach out for much needed medical attention only left me frustrated, angry and confused. No one would listen to me...not in a empathetic manner or even exercise their code of medical ethics toward me as a victim of some type of invasion that had left me clueless, scared and frustrated at the medical world for not knowing.... thank god I found Ungex! 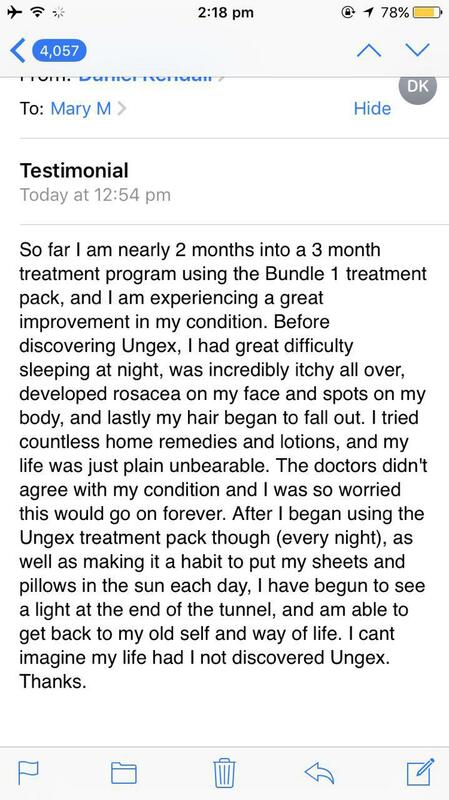 I am writing to You with grateful heart a little over two months of using Ungex protocol & products. Please share my story if you feel it would support others in their journey back to balance. This is a saga and please edit it to help others. In August 2016 I was bitten by some species of black fly while hiking. I had high fever for two weeks leading to my immune system becoming comprised. Coming into this episode with an already weakened immune system from fighting Lymes, systemic candida, tooth infection, antibiotics. My left brain was imbalanced, I could not walk straight -I would walk sideways. I was frail and very sick. With the help of a specialized Chiropractor after a few months I was feeling much better. Octocber 2016 my hair started to fall out and itchiness with no rash began. I felt like I had bugs running all over me. The hair on my head was all over my clothing, in the drain and the brushes. I figured - Bad dye job! The hair that I was losing had the matrix. It was coming out from the scalp not the breakage that would come from hair product. So fast forward through misery and the most uncomfortable months with this we come to late December. I am then sparsely bald and really very sad- thinking I would have to experience this forever, good grief!!! So researching the internet one night sometime near Christmas- I found the subject of Dermodex. I couldn’t possibly have this! I have impeccable hygiene! Creepy stuff! I was so desperate. Praying for help found the Ungex website. Mary answered my phone call@It was midnight my time zone. I was in tears as she explained that there was help. I ordered the bundle that she recommended. In the interim my chiropractor wanted me to see a dermatologist, which I did. The demonologist concurred that my immune system crash caused the hair fallout. Assuring me it would re-grow-yet I was so itchy,he prescribed topical steroid, which I hesitated in using. My Ungex bundle came that same week so I opted to follow the Ungex protocol. 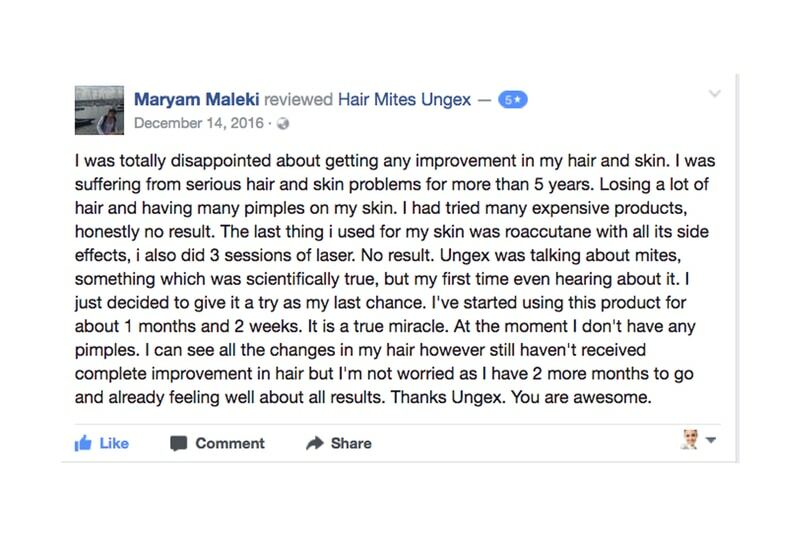 Mary called to clarify how to use best Ungex products. I was a bit difficult at first because my day habits didn’t mesh with her night instructions. She encouraged me as well. Then I received the high frequency unit to utilize on scalp and face. I did use the topical steroid prescribed sparingly. Mary gave me encouragement to continue the Ungex in the evening. My chiropractor also was treating me for a fungal overgrowth. The second and third week were tough. The third week of January the itchiness started to abate. It was becoming more cyclical . Itchiness was still there not as horribly uncomfortable. I gave her a hard time. Because of my work, I did cheat with extra showers. Her directions were evening showers don’t over wash my hair. Use coconut oil on my skin & hair. Dermatologist visit confirmed my hair is now growing back. Humbly following my Ungex protocol the itching has just about stopped. I am soooo-much more comfortable. My immune system has improved using advised supplements from chiropractor . I emailed Mary to tell her. I wanted her to know how grateful I am about her steadfastness and guidance through this ordeal. Mary asked me to share my journey. I would like to convey that Ungex products are generous. My scalp is covered with hair again -two or three inches of it ! Very little if any, itchiness. I hope that others will find Ungex and trust the process. Please give Mary an easier time than I have.